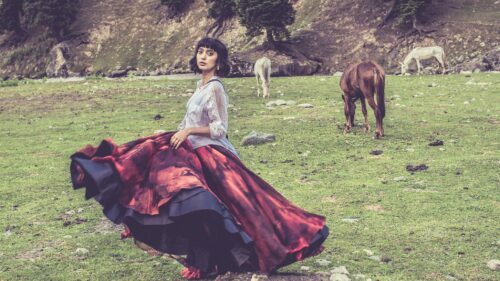 For Bollywood hopefuls, actress Sayani Gupta offers up an inspiring story. With no prior connections, the Kolkata-born talent enrolled in film school, moved to Mumbai and quickly ascended the film world ranks. Before her remarkable indie film debut, Margarita with a Straw, firmly established her as a rising talent, Gupta had dabbled in everything from ad campaigns to theatre roles. Now, she’s appearing in Bollywood-led star vehicles, like Fan (where she acted alongside superstar Shah Rukh Khan) and Baar Baar Dekho. From what life is like inside the Bollywood whirlwind to her most inspiring filming experiences, read on for a vision of India through Sayani’s eyes. Greaves: Your films range from the alternative to the mainstream. Tell us about your journey through Bollywood. Actress Sayani Gupta: ‘After graduating from the Film and Television Institute of India, my first film was Second Marriage Dot Com in 2011. Around the same time, I also did a Bangla feature film, ads, theatre and shot (and doubled up as crew) for Saeed Mirza’s docu-fiction travelogue, Yeh Hai India Meri Jaan, where we travelled through the interiors of India. Eventually, I auditioned for Margarita with a Straw; I lived like a blind person for a month for that role. At the time, I thought that the film would make my career or break it. Thankfully, it worked, and then mainstream work followed! I recently finished shooting for Anurag Basu’s Jagga Jasoos, which hasn’t been released yet. Making Fan with Shah Rukh Khan was also an amazing experience. Can you describe the cultural scene in Mumbai and Kolkata? ‘In Kolkata, I grew up in a culturally vibrant space. My father was a musician, singer and lyricist with AIR (All India Radio) in Kolkata, and he also helped found an annual classical music festival. As a family, we watched world cinema, not Bollywood! In terms of local cultural destinations, Nandan on Park Street used to be a big hub, and we would walk into Rabindra Sadan for film screenings and theatre performances. In Mumbai, the cultural scene is in town around the Kala Ghoda area, and in coffee shops where exciting ideas are brewed. Directors like Rajat Kapoor and Atul Kumar are doing good work in theatre. Could you share an anecdote from your travels when making Yeh Hai India Meri Jaan with Saeed Mirza? There were two wells in the village, but the water was very salty and only good for camels. For drinking water, women in the village had to walk 24 kilometres every day. My colleague and I were invited to Amma’s house. It was bare, with a mud roof, and she asked her son to make us tea. This was precious water that she was using for us. It really moved me. We also spent a night with nomadic goat herders in Patnitop, Kashmir. We sang and danced with them, and they cooked for us in earthenware pots with tomatoes and vegetables they picked themselves. We were in the Himalayas, surrounded by waterfalls, and it was the most exquisite meal I’ve ever had. Is there a director whose vision of India you particularly admire? What’s the most incredible place in India you have visited? Where do you like shopping in India? Any designers you would recommend? ‘Delhi is fabulous for shopping – from high-end designer outfits to clothes for Rs 100 that you can also wear to a party. I really like the couture brand Jade by Monica & Karishma, and Sahil Kochhar is someone to watch out for – his creations are art. I also love Payal Khandwala’s designs for their bold block colours. Could you recommend your favourite places to eat in Mumbai and Kolkata? ‘6 Ballygunge Place in Kolkata serves Bengali cuisine, and they do a date palm jaggery ice cream that’s exquisite. I like Mocambo, and always seek Kolkata’s roadside food, particularly Bedouin rolls and puchkas. Finally, what does India offer that no other place can match?